The brilliant Fast Running has an excellent roundup of the top UK non-elites and club runners here so I won't replicate their sterling work. 7 British athletes placed in the top 10 non-elite alond with two USA and one Canadian athlete. Overall, the non-elite field (according to the VLM site) was won by USA's Georgia Porter in 2:44:50 (though given that she has an IAAF profile, she's not in quite the same category as others in the list). Regardless, huge respect to her given that it seems to have been her first ever marathon after a 1:18 half in las Vegas last November . 3rd place went to another American - Laura Bowman who, if my research is correct, started a running group in her workplace of San Quentin Prison called the 1000mile club. Hannah Oldroyd topped the British club runners with a 3'40" PB of 2:46:27 which is even more awesome given that NO-ONE was hitting their paces, let alone getting personal bests. She ran her first ever London Marathon in 2013 in 3:17:49. I love this article about Hannah which basically says "she's a total Amateur, she races too much, doesn't specialise , but she's flipping good! 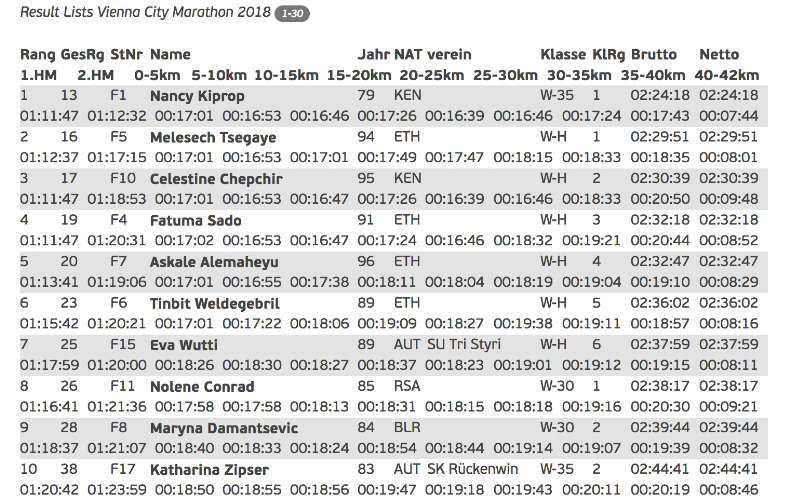 In the elite race you'll probably be well aware that Mary Keitany didn't hit the Word Record (FastRunning // Athletics Weekly) and instead it was won be (slight outsider) Vivian Cheruiyot in a personal best of 2:18:31 which will apparently earn her £40k of prize money. I find this very exciting as she's only one year younger than me. All is not lost! Boiling temperatures also at Zurich Marathon. It was won by local, skiier and ultrarunner, Maude Mathys in a PR of 2:31:17. The Neue Zurcher Zeiting reports " the 30-year-old from Vaud looks forward to mountain racing in the summer of 2019 in Zermatt and then onwards to the Olympic Games in Tokyo in the summer of 2019. " Interestingly, Maude underwent the same fertility treatment as me (Clomiphene) and was reprimanded by WADA but let off because of the circumstances.